I'm a Christmas freak - because I have to be. I'm working on this year's TBC light show (slated for Dec 12, 13, and 14) and I'm looking for one more song. Just discovered Christmas music 24/7 on iTunes. 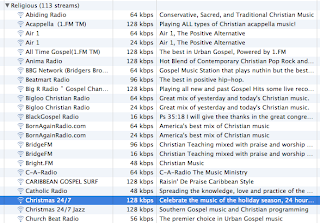 It's pretty close to the Caribbean Gospel Surf channel. Geeeesh! You can listen without iTunes on their page as well.